On October 1, Catholics around the world honor the life of St. Thérèse of the Child Jesus, or St. Thérèse of Lisieux on her feast day. St. Thérèse was born January 2, 1873 in Alençon, France to pious parents, both of whom are scheduled to be canonized in October 2016. Her mother died when she was four, leaving her father and elder sisters to raise her. On Christmas Day 1886 St. Thérèse had a profound experience of intimate union with God, which she described as a “complete conversion.” Almost a year later, in a papal audience during a pilgrimage to Rome, in 1887, she asked for and obtained permission from Pope Leo XIII to enter the Carmelite Monastery at the young age of 15. On entering, she devoted herself to living a life of holiness, doing all things with love and childlike trust in God. She struggled with life in the convent, but decided to make an effort to be charitable to all, especially those she didn’t like. She performed little acts of charity always, and little sacrifices not caring how unimportant they seemed. These acts helped her come to a deeper understanding of her vocation. She wrote in her autobiography that she had always dreamed of being a missionary, an Apostle, a martyr – yet she was a nun in a quiet cloister in France. How could she fulfill these longings? Thérèse offered herself as a sacrificial victim to the merciful Love of God on June 9, 1895, the feast of the Most Holy Trinity and the following year, on the night between Holy Thursday and Good Friday, she noticed the first symptoms of Tuberculosis, the illness which would lead to her death. Thérèse recognized in her illness the mysterious visitation of the divine Spouse and welcomed the suffering as an answer to her offering the previous year. She also began to undergo a terrible trial of faith which lasted until her death a year and a half later. “Her last words, ‘My God, I love you,’ are the seal of her life,” said Pope John Paul II. Saint Thérèse was proclaimed a Doctor of the Church by Pope John Paul II in 1997 - 100 years after her death at the age of 24. She is only the third woman to be so proclaimed, after Saint Catherine of Siena and Saint Teresa of Avila. 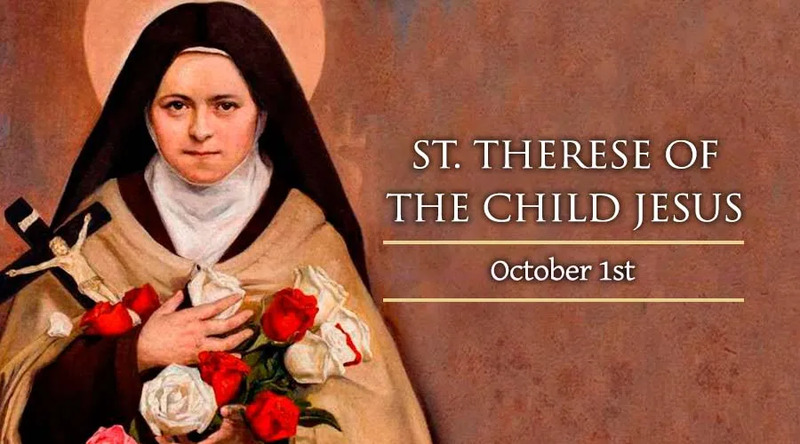 St. Thérèse wrote once, 'You know well enough that Our Lord does not look so much at the greatness of our actions, nor even at their difficulty, but at the love with which we do them."